"The estate tax is only a faint shadow of its former self. 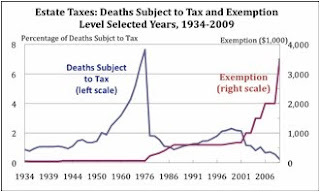 In 2009, less than one-quarter of one percent of deaths—just 5,500 decedents—will leave taxable estates, the smallest percentage since at least the Great Depression." "Opinion polls show significant numbers of voters saying they would more likely vote for a candidate who favors repeal. Maybe they all think they’ll win the lottery or their next great idea will become another Google. In the real world, we’re spending a lot of time worrying about a tax that fewer than three in a thousand of us will pay. And, when we do, we’ll be dead." Huge lobbying interests are at play, of course: watch Citizens for Tax Justice demolish some of the lobbyists' arguments here, and read more on U.S. estate taxes here. "A group of rich Germans has launched a petition calling for the government to make wealthy people pay higher taxes. The group say they have more money than they need, and the extra revenue could fund economic and social programmes to aid Germany's economic recovery. Germany could raise 100bn euros (£91bn) if the richest people paid a 5% wealth tax for two years, they say." “Tax law changes have benefited this group, including me, in a huge way. During that time the average American went exactly nowhere on the economic scale: he’s been on a treadmill while the superrich have been on a spaceship.”"
What buffett does with his own money is for him to decide. He does not need the Government to tax his estate to get their hands on it. The Government also permits Americans to give directly to the Treasury. Interestingly enough, some people do. If Buffett is so in favor of the Government taxing his estate, then he is more than welcome to leave his estate to the Government himself. That would be putting money where his mouth is. Can anyone explain to me why there should be a tax levied upon the accrual when someone died? What for? Greed, envy or just to "buy" votes with other´s money. Fortunately some modern states have abolished such tax. And if some feel their bank accounts as a burden it is up to them to give it to those whom they consider to be in demand. Let´s hope that they are mature enough not to need a nurse called state to help them in their willingness to support others.